Tutorial approach. 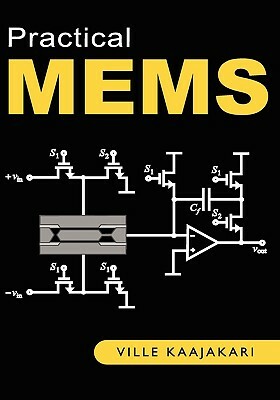 The book emphasizes the design and analysis through over 100 calculated examples covering all aspects of MEMS design. Emphasis on design. This book focuses on the microdevice operation. First, the physical operation principles are covered. Second, the design equations are derived and exemplified. Practical MEMS is a perfect companion to MEMS fabrication textbooks. Quantitative performance analysis. The critical performance parameters for the given application are identified and analyzed. For example, the noise and power performance of piezoresistive and capacitive accelerometers is analyzed in detail. Mechanical, resistive (thermal and 1/f-noise), and circuit noise analysis is covered. Application specifications. Different MEMS applications are compared to commercial design requirements. For example, the optical MEMS is analyzed in the context of bar code scanner, projection displays, and optical cross connect specifications. MEMS economics and market analysis. A full chapter is devoted to yield and cost analysis of microfabricated devices. In addition, the market economics for emerging applications such as RF MEMS is discussed.